Endeavour I, 1934, America's Cup 130' J-Class Sloop Challenger. Designed by Charles E. Nicholson. Museum quality yacht model. Exclusive hand made construction, it has been built from the the best wood essences and innovative materials. This model of Endeavour combines the careful execution of every detail with the high quality of the materials and the craftsmanship. Deck fittings are amazing and very detailed. The model has been built according to the new Endeavour after its refit by Elizabeth Meyer in 1989. Model has blue topsides, white cove stripe , white boot stripe and dark red bottom paint and teak-style deck. 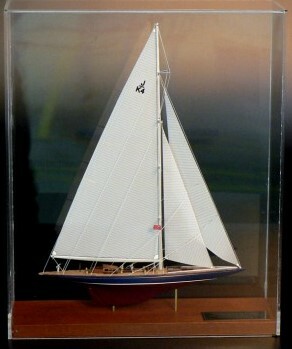 Model comes with dacron sails and is ready to display. It is mounted with brass pedestals on a high-quality hardwood display base with a gold trim. Enclosed in clear acrylic case, measures 10" L x 3.25" W x 12.25" H. Felt lined base underside will not scratch your furniture. Model Specifications: Plaque: 29" L x 7.9" H Hull Length: 23.6"
Our vendor employs highly skilled craftsmen who work only with the finest materials. Hundreds of hours go into making each model, from the original lofting of plans to the finishing touches. Hull construction is either hand laid-up resin or plank on bulkhead with a selection of precious wood. Deck details are reproduced with custom-made brass and chromed brass castings. Hand sanded hulls are finished with marine varnishes and polyurethane paint.